You have to be pretty strong-minded to not sneak a peek at your other half’s phone if the chance is presented. Our survey highlights that it is, in fact, men that come off the most suspicious, explore our data find out the thoughts and trends behind an everyday phone snooper. 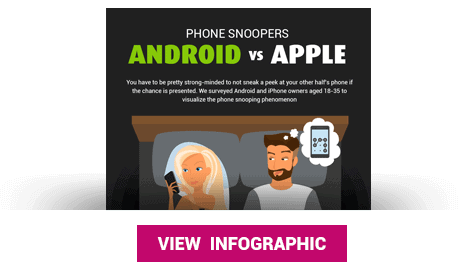 BankMyCell conducted a survey of 1,663 people aged 18-35 to visualize the phone snooping phenomenon. We wanted to discover not only how many millennial’s are looking at their partner’s phones, but how couples felt being on both sides of the fence. We created a series of questions to find out why they are snooping, which apps they used to conduct their investigations, if they secretly knew passwords and how it impacted the lifespan of their relationship. The survey was conducted by BankMyCell between 10/01/2018 to 10/31/2018 in the U.S.
Who are the worst culprits when it comes to phone snooping? If asked by their partner, would they let them check their phone freely? Who knew their spouse’s phone passcode? What is the core reasoning behind checking their partner’s phone? Where on the phone do they direct their investigation? Did they find anything? Was this breach of trust worth it? Would you break up with someone for snooping on your phone? Have you ever broken up with someone because of something you found on their phone? How does this behavior correlate to social media snooping? WHO IS GUILTIER OF CHECKING THEIR PARTNER’S PHONE? When asked if they have checked their partner’s phones, it was revealed that men were the worst culprits. 68% of men surveyed admitted they check their other half’s phone, with 38% doing so without their spouse’s permission – which suggests it’s perhaps men can be the most insecure and untrustworthy in relationships in this digital age. WHO IS AT EASE HANDING OVER THEIR PHONE? According to the data, the irony is that most members of a couple wouldn’t mind their partner looking through their phone. 89% of women feel they have nothing to hide and would be happy for their significant other to browse through if they asked. The majority of men also agreed with the statement, however, 18% of men were uncomfortable with letting their partner browse around into their cell phone activity. WHICH SNEAKY SAUSAGES KNOW THE PASSWORDS? 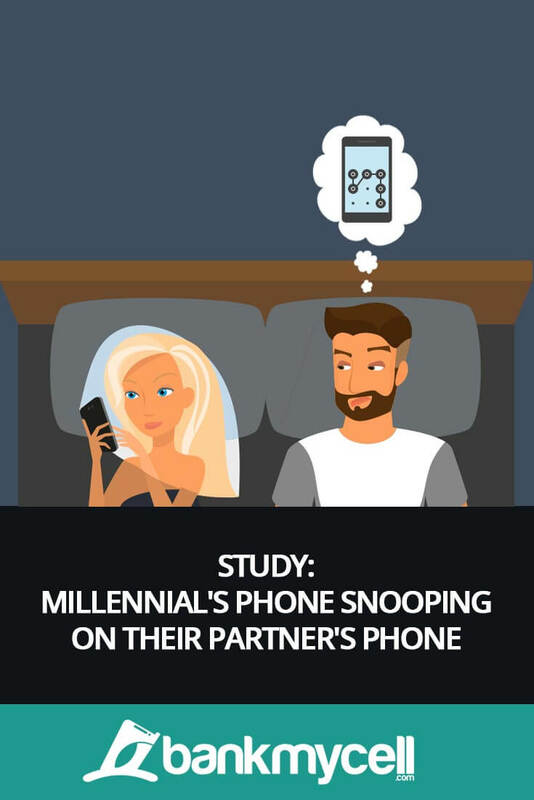 Over half of the men surveyed know how to gain access to their significant other’s phone, free to snoop away at any opportunity! When analyzing women’s responses, it turned out that a much lower figure of 36% knew the password or code to get into their partner’s phone. It’s worth highlighting that couples snooping without permission may have the brakes pumped by face ID and fingerprint scanners (the anti-snoop tech). WHAT ARE THE TRIGGERS THAT COMPEL THEM TO CHECK? The most popular motive behind sneaking into their partner’s phone was fears of infidelity… are they talking romantically or sexually to someone else? Again, men responded the highest with 89% confessing to checking their spouse’s phone due to an underlying suspicion of them being up to no good. However, 30% of women surveyed are claiming they were simply curious and want to have a nose around. WHERE DO THEY THINK THE SECRETS RESIDE? When it comes to satisfying their suspicions, messages, social media and photos are the biggest targets on the phone snooper’s hit list. Their underlying suspicion sends 64% of women to WhatsApp, and 25% to text messages/iMessages. As well as WhatsApp at 62%, men are also directing their detective work in social media at 46% and the risky business of their spouse’s camera roll at 31%. WHAT RESULTS DID THE PRIVACY INVASION YIELD? When queried if they had, in fact, found some form of evidence of their other half being disloyal in any way, almost half responded yes. It turns out that these deep seeded suspicions and apprehensions did pay off at some point, discovering incriminating evidence that they found unacceptable. A high 49% of women surveyed came back saying they had found something, and 46% of men. HOW WOULD THEY REACT IF THEY GOT SNOOPED ON? Looking back at the comfort of our respondents in regards to their partner looking at their phone with permission, it seems many would have an extreme reaction to catching a sneaky snooper. 9 in 10 women would be happy to let their partner look at their phone, but 1 in 6 would break up with their significant other if they caught them having an unsolicited peek. Similarly, 5 out of 6 men would be happy to pass over their phone but 1 in 4 would fire fatal relationship shots at the person snooping. HAVE THEY HAD TO BACK UP THEIR BREAK UP STATEMENT? When asked if they have been involved in any relationship altercations due to phone snooping, 1 in 10 guys finding suspicious or incriminating evidence on their partner’s phone eventually ended up breaking up with them after. A still considerable 7% of women also agreed with the statement, and 11-12% of both genders surveyed got in some serious ‘on the ropes’ relationship arguments because of it. WHO IS SOCIAL MEDIA SNOOPING? DO YOU CHECK YOUR PARTNER’S SOCIAL MEDIA ACCOUNTS? Finally, to put some perspective on the phone snooping epidemic, we asked our respondents how they interact with their significant others social media accounts. From the responses, it suggests women are much happier being nosy on social media, alternatively, men go straight for the phone. 9% more women snoop on their partner’s social media account than a phone. However, 6% more suspicious men check their other half’s phone rather than social media.